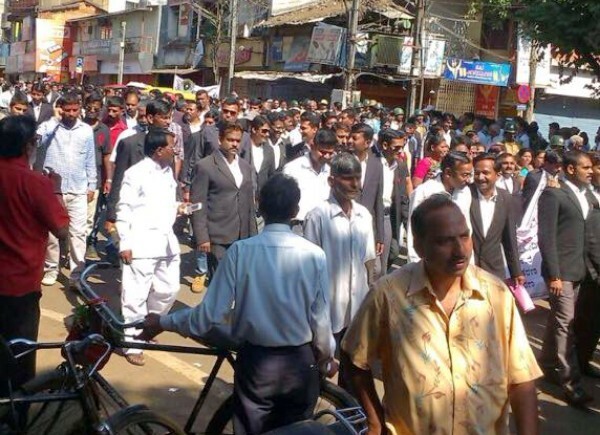 The Bandh call given by the Belagavi Bar association for the establishment of KAT bench also had support of many other organizations had a mixed and partial response. In the protest rally taken out the protesters saw that all shops were closed or asked to close the shops in some cases. Many visitors in the city caught unaware of the bandh were in a miffed situation with not knowing what to do. We also overheard people asking the Advocate fraternity what this KAT was and what was its benefit for the common man. Commissioner of Police, S Ravi said that Bandh was all peaceful and no impact of the bandh was visible in the city and if someone forced to close shops they will be dealt according to law.